Let me just start by saying that driving to and through Charlevoix was one of the most beautiful drives I’ve done within Canada - the winding roads, the trees with their changing leaves on one side and the Saint-Laurent River on the other. I must’ve pulled over at least five times just to take photos. Sabrina and I left Montreal early in the morning and arrived in Baie-Saint-Paul three and a half hours later. I had seen so many photos of Baie-Saint-Paul on Instagram lately and was so happy to finally be here. After lunch, we walked along the main street: Saint-Jean Baptiste and explored the local boutiques, made friends with a few dogs (obviously) and decided to check out the Musée d'art contemporain de Baie-Saint-Paul, which is actually the only museum in eastern Quebec entirely devoted to preserving contemporary art from 1947 to the present. The black and white photography was my favourite part. 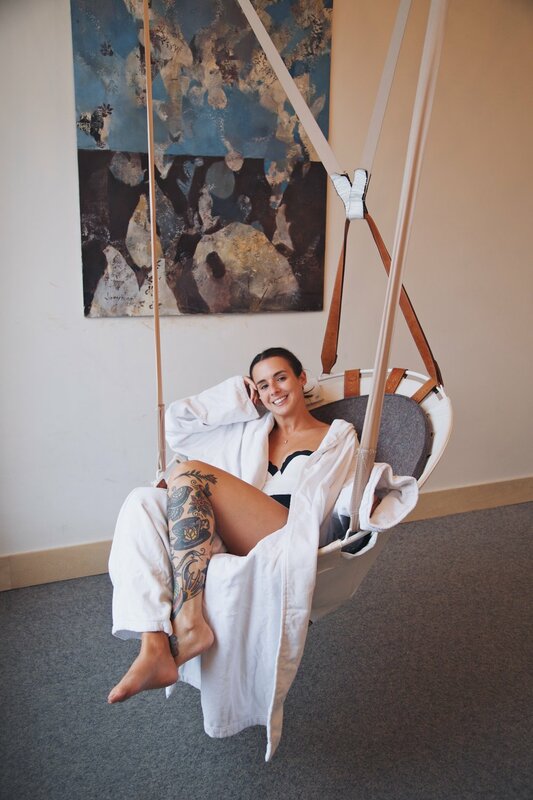 That afternoon, we checked in to Hotel & Spa Le Germain Charlevoix which had all of the Scandinavian vibes and I loved every bit of it. Our room was super cozy and rustic, and had a stunning view overlooking the mountains and some cows (the more animals the better!). We had an hour and a half to kill before dinner and so headed down to the spa, which was completely surrounded by fields, with hues of red, orange and yellow dotting the mountains off in the distance. Apart from the variety of hot tubs, we also used the sauna and my personal favourite: the eucalyptus steam room. We had a killer dinner at Le Mouton Noir and knocked out early due to two food comas and one eucalyptus steam room. We woke up early to grab a quick (and very delicious) bite at Boulangerie a Chacun Son Pain and decided to drive down to the beach before heading off to La Malbaie for the rest of the weekend. The beach was a slice of heaven: completely secluded with a long stretch of sand between land and water with stunning views of the sun breaking through the clouds and a landscape that made me dream for days. We spent quite a bit of time there just taking it all in. 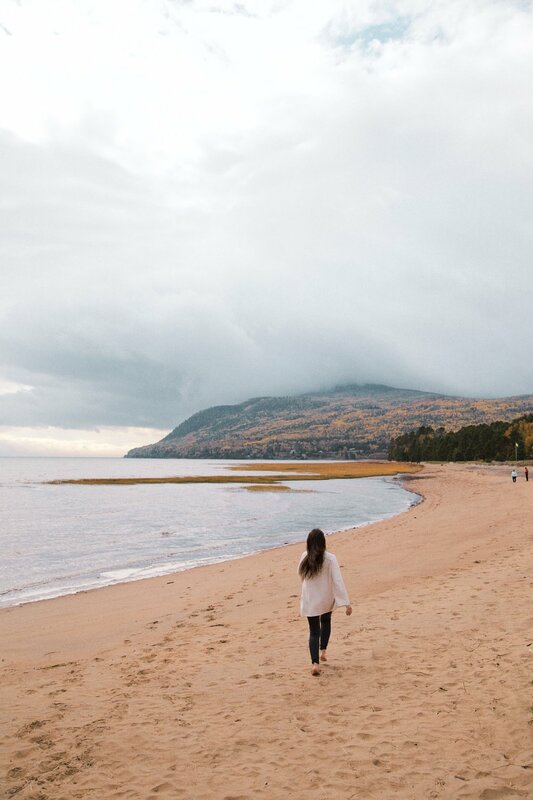 La Malbaie is only about 45 minutes away from Baie-Saint-Paul, so it’s a must when visiting Charlevoix. Our first real stop of the day was at Les Jardins du Centre: a vegetable farm and local products grocery store that has about 40 varieties of unusual vegetables like blue potatoes, and they also had massive amounts of pumpkins coming in all different sizes and colours. They also pickle their own vegetables and make jams, so I bought a few things to bring home for my parents. 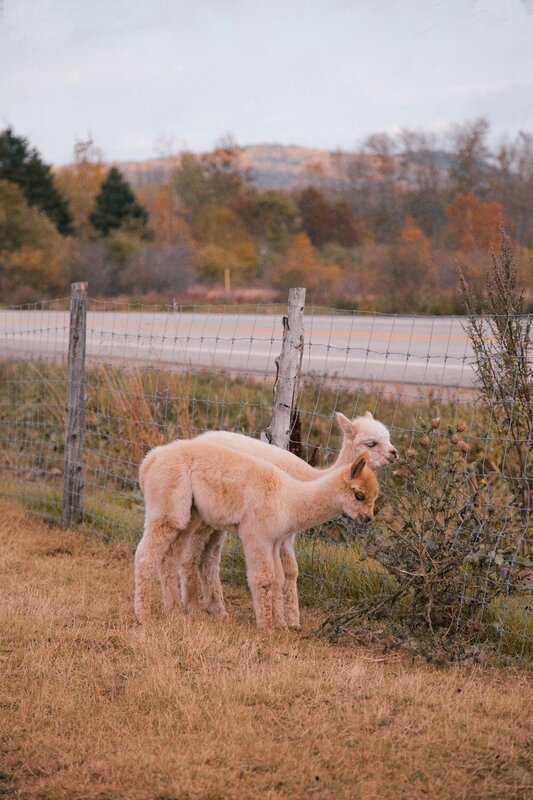 As we made our way to lunch at Boulangerie Pains d’Exclamation!, we drove by an Alpaca farm. Sabrina and I both saw the sign, looked at each other, screamed for a bit, (aggressively) turned the car around and decided lunch could wait a bit. Nothing is more important than petting alpacas. NOTHING. I couldn’t tell you how long we stayed, but we were very late for lunch and ended up missing the hike that came afterwards. Oops. In all seriousness though, seeing the alpacas was definitely a highlight of this trip. We ended up arriving too late for our hike on the Anse-de-Sable Trail, so we hung around at the base enjoying the views of the mountains and water for a while. That evening we checked into Auberge des Peupliers, a lovely bed and breakfast, and we had a cozy cottage-esque room with a fireplace that I never wanted to leave. Fun fact: one of my favourite sounds is the crackling of a fire. Unfortunately we didn’t get to do anything on the itinerary for today because it was raining all day. I was looking forward to the hike, but being indoors, all cozy with the fireplace going and getting some work done was also a good alternative. We ended up driving back to Montreal earlier due to the weather, but we were so happy with the first two days of the trip that it didn’t matter. This weekend was so wonderful and I truly can’t wait to go back next fall with my family!